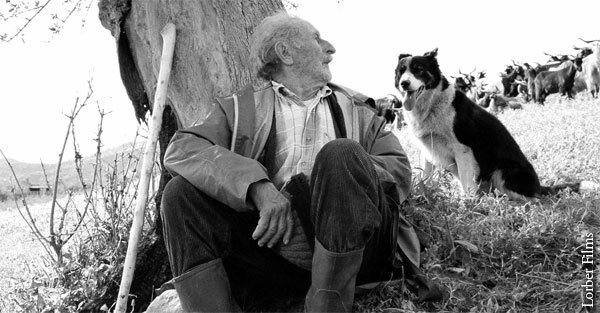 Giuseppe Fuda, the goatherd, turns to the concern of his dog. This beautiful, contemplative film, set in southern Italy in the area of the Calabrian hills, takes its title, Le Quattro Volte, from Pythagoras, who lived in Calabria in the 6th century BCE. He spoke of each person having four lives—the human, the animal, the vegetable, and the mineral— "Thus we must know ourselves four times." With no dialogue, the slow action of the rural village unfolds and we enter the rhythm and sweep of life itself. The only sounds are those of a dog barking, insects buzzing, bells ringing. We are invited to leave our usual world and be present to what appears. Through languid scenes of nature and a village seemingly of another time we are introduced to an elderly goatherd and his routine of taking the goats to pasture, aided by his dog. He brings milk to the local church and exchanges it for "holy dust" swept up by the charwoman that he takes back to his bare room to mix with water and drink. Is it a medicinal, a folk remedy? We observe but are not led to conclusions. Throughout the film there is the connection of the humans to one another, dependent on each other for food, fuel, spirituality, community. In turn, the humans are dependent on the animal world. The Work idea of the reciprocal maintenance of everything existing seems to be suggested. Impermanence, devoid of sentimentality, is a constant theme. The goatherd dies surrounded by his animal charges, his only witnesses; the townsfolk see him to his crypt without emotion. The perspective and tone throughout the film is objective; we are not asked to identify with the goatherd in a personal way. We do not know his background, only that he makes his rounds as he always has and fulfills his role within the community. When he dies a much younger, more vital man takes his place, with the implication that he, too, will live out his life in the same way. And the goatherd’s death is followed by the birth of a baby goat—seemingly the human form devolving to the animal. The kid in turn will be separated from the herd and die under a majestic tree, devolving to the vegetable, and the tree, after being felled to serve the community's revels, will become charcoal, or mineral, that will heat the villagers' homes and cook their food—and so the four times. The pattern plays out over and over mechanically. Eternal recurrence. 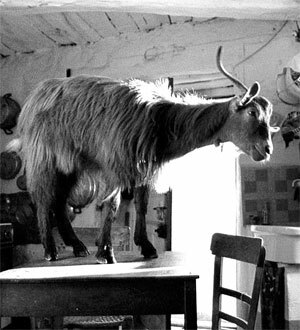 A goat gazes at the goatherd who has just died. The opening scene of the film is mysterious; we don’t know what a large black mound is, what the men surrounding it are doing. It looks like a pyre or a pagan altar. It's only at the end that we return to the mound and are shown the process of firing the charcoal. So the beginning and end are one and the same—the eternal mystery. Le Quattro Volte ends with the smoke from the charcoal wafting into the ether, mixing with the elements.